Lobular carcinoma in situ (LCIS) is not cancer, but a precancerous condition in which abnormal cells are discovered within a milk gland, or lobule, of the breast. These cells are only within the lobule and have not spread to surrounding tissue. Rarely detected through mammography or felt during an exam, LCIS is typically found when there was another area of concern revealed on a mammogram or during an examination that necessitated a biopsy of breast tissue for assessment. As those tissue samples are analyzed in the laboratory, LCIS may be diagnosed. If LCIS is identified, your doctor will need to evaluate its extent and whether there is any evidence of breast cancer present. Since this condition increases the risk of developing breast cancer, close monitoring is considered essential. 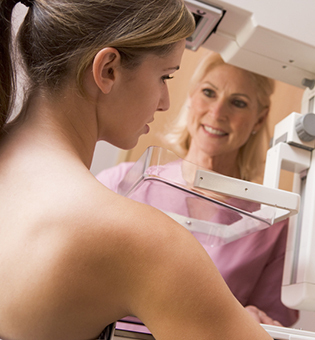 Most often, a recommendation of improved surveillance will be made, in the form of several physical examinations and one to two mammograms per year. This will provide your doctor with regular information on your breast tissue so that if cancer develops, it will be caught and treated at a very early stage.